As I have already mentioned in my post about packing for the Camino, you can loose some of your backpack's weight by using a digital guidebook instead of a paper one. It can work out great if you use it together with one of many available Camino smartphone apps. I looked at quite a few of them and in the end I chose Camino Pilgrim. It is a free application you can easily download through Google Play. It covers Camino Frances and Camino Finisterre branches of El Camino de Santiago. I was using version 1.4.0. You can see the app's icon on the photo below. It has all the towns and villages listed in the same order as they appear on the Camino with distances from one to the next. Under the name of each town there are icons representing available pilgrim facilities (albergues, ATM, water fountain, pharmacy etc.). 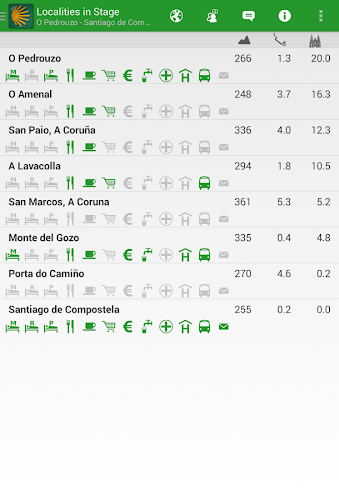 By tapping on a town's name a list of available albergues opens up. Apart from basic info (address, phone, webpage, email address and opening hours) there is also other information available. Albergues are arranged into three groups: Municipal, Parroquial and Private. There is another set of icons on this level. They represent facilities available in a specific albergue (kitchen, washing machine, wifi etc.). There is also information about price and total number of beds. By tapping on an albergue a map by Google Maps with a position of the albergue opens up. When your smartphone has GPS connectivity turned on, your current position will also be shown on the map. Camino Pilgrim application does not require an active internet connection to work. To be able to use maps off-line, you can even download them in advance. It is however advisable to open the app once in a while, when connected to internet, to allow its database to refresh. If you are doing the Camino on a bike the map feature might not be very useful - bicycle map is not included. At the moment the app is only available on the Android platform. No iOS support so far. Some photos of albergues would be a welcome addition. The same applies to non-existent user ratings and comments about individual albergues. There is a useful tutorial available on-line for those in need of step-by-step instructions. 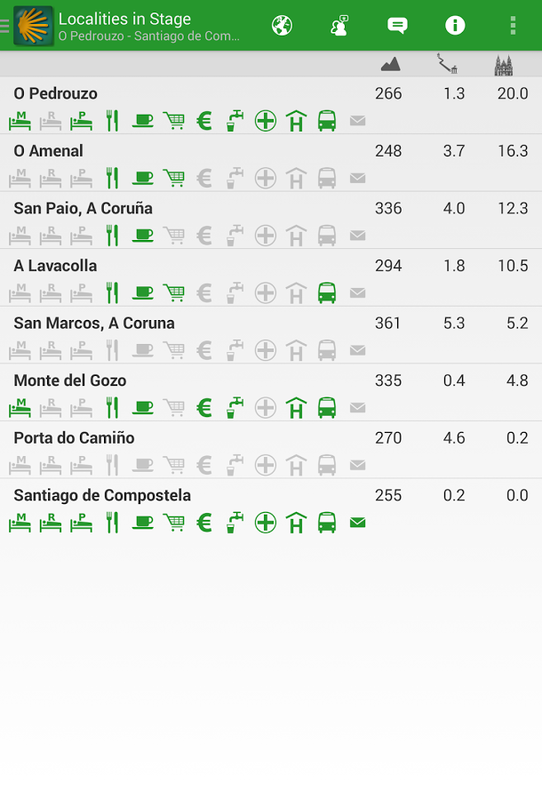 Camino Pilgrim is a simple app which proved to be very valuable on many occasions on the Camino. For instance when the path got crowded and we were walking in a group, getting a bed late in the afternoon was not a sure thing any more. Tapping on a phone number next to an albergue name in the app and placing a reservation, made our walk even more enjoyable. I highly recommend this app. Try it out yourself - it is free. You are welcome to leave your observations in the comments section below. This review contains my own unbiased opinion which was not influenced by anyone. I also did not receive any kind of compensation. User interface photos were downloaded from Google play and therefore I do not own any rights to them.